Bacon is one of the most popular foods in the world. Nowadays, you can even get bacon sundaes, bacon ice cream, and alarm clocks that awaken you to the smell of frying bacon. Just when you thought bacon couldn’t get any better, along comes chicharron. Believe it or not, it could be better than bacon. If you think Colombian coffee is great, wait until you’ve tried this all-day snack. Put simply, this dish is like bacon on steroids. It’s also made from pork belly — except it’s carved into thick rashers instead of slivers. Another variety consists of only the skin, or rinds, which are deep-fried. Chicharrones originated in Spain but soon made their way to Latin America, where the Colombians perfected the dish. The process is simple enough, but there’s a knack to it. 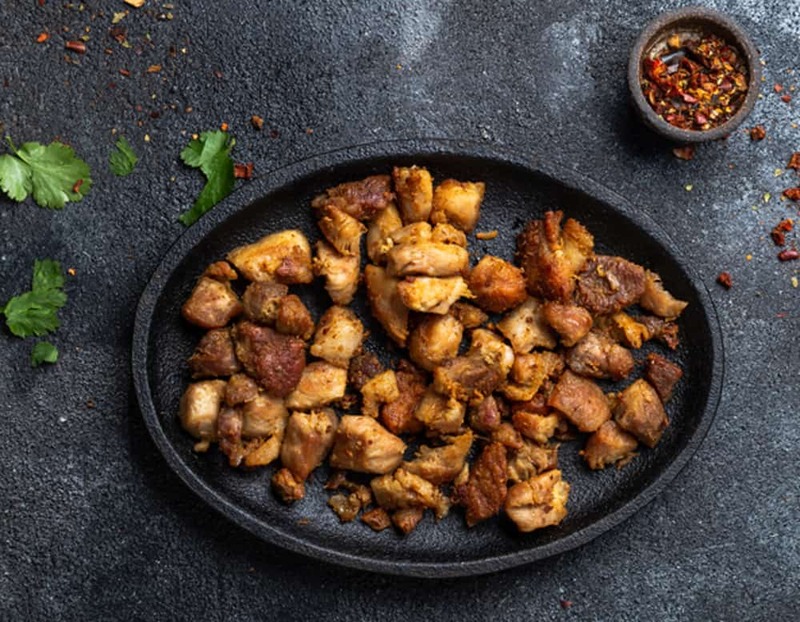 Try out this chicharrones recipe and see if you can master the art. The ingredients are pretty simple. All you need is 1½ pounds of pork belly, 1½ teaspoons of baking soda, 2 cups of water, and as much salt as you want. You’ll also need a frying pan or wok, some paper towels, a sharp knife, and a chopping board. Slice the pork belly into one-inch thick strips. Rinse the strips and pat them dry. Rub baking soda all over the meat and place it in a container. Cover and refrigerate for at least one hour. Remove the strips from the container, rinse them and pat dry. Next, place the strips on a chopping board, skin-side down and slice them into portions. Afterward, cut into each piece making 1½ inch crosswise cuts. Be careful not to cut through the fat and skin. Fill your pan with enough water to just cover the pork belly. Add a little salt and then place the meat in the pan. Cover and bring the pan to the boil over high heat. When it starts bubbling, turn down the heat to medium-low. Cook the meat for about 1½ hours or until the water has evaporated. There should be quite a lot of rendered lard at the bottom of the pan, don’t discard it. Increase the heat to medium and fry the pork strips until golden brown on all sides. This should take about 20 minutes. The lard will get quite hot and start popping, stay out of the way! Remove the pork from the pan and place it on paper towels to drain. Season them with salt and allow to cool slightly before serving. There’s not a lot that can go wrong with this simple yet delicious dish. The only problems you might encounter are if you skimp on the boiling time or allow the oil to get too hot. Both these blunders can result in your meat coming out tough and chewy. A little patience and attention to detail go a long way in Colombian cookery. Your first experience of a chicharron is sure to whet your appetite for more Latin American delicacies. Keep reading our blog to learn more about all the Latin foods you love, and visit our online store to stock up on all your favorite ingredients.